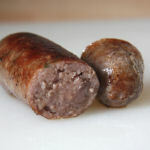 We've tried other beef sausages and they were not that impressive, so how does this one from the Churchgate Sausage Company compare? They do have a high percentage of beef, Guinness beer and some spinach thrown in for added taste, and all packed in to quality hog casings! Plenty of iron in these it looks like then! Beef sausages we've tried previously tend to taste very burger like to be honest when cooked, so expectations were set unfortunately. Now what a surprise we had. Quite a "beery" aroma and flavour but certainly you can't say burger like at all! The skins cook up and brown really well and the course-ish texture of the beef retains quite a succulence. A blooming good bite and chew! However, these were unfortunately a bit too "beery" for a couple of my fellow samplers (two of the ladies) and although they said these sausages were OK, I know that they weren't too taken with them. 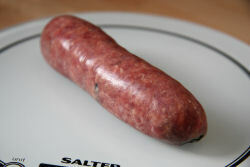 A very well made sausage though as far as I'm concerned. Jason Drage of the Churchgate Sausage Company certainly knows his stuff when it comes to sausage making. This beefy Guinness one is a recipe you really must try. 115x34mm before cooking, 100x34mm after. 84g before cooking, 74g after. That's a shrinkage of 13% & weight loss of approx 12%.